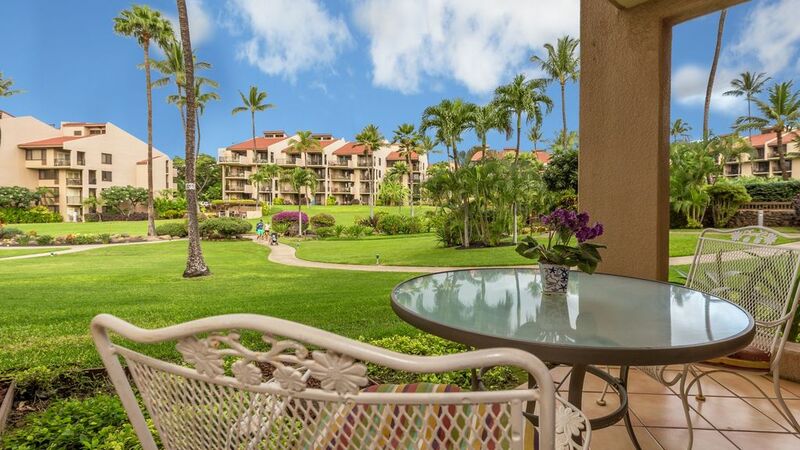 Our condo 7-106 is a fully-remodeled beautiful one-bedroom, two-bathroom unit on the ground floor of the Kamaole Sands complex in Kihei, Maui. Very spacious, easily accommodating four people, it has a private lanai which opens into the tropical garden of the central court in Kamaole Sands resort. The entire floor is tiled, both bathrooms are completely renovated with high quality tile, fixtures and faucets, the kitchen is totally rebuilt with new cabinets, appliances, plumbing, sink and faucet. The bedroom has a king-size bed with a high-quality new firm mattress, a flat-screen TV with cable, and a portable A/C, that was permanently and professionally installed. The living room has a pull-out sofa with a high-quality foam mattress, a second cable television with a VCR, as well as a CD player, a telephone, and its own A/C unit. The kitchen is fully equipped with a refrigerator, a dishwasher, a microwave, a conventional oven, and a sink with a disposal. We also have washer and a dryer. Linens and towels are provided. The owners' bedroom closet is also available to guests. It contains a number of useful items, including two beach chairs, an umbrella, and some sand toys. Kamaole Sands resort is located at the southern end of Kihei and is within 5 minutes of the world-class championship golf courses at Wailea and Makena. It is a large and beautiful resort that includes 4 tennis courts, 2 jacuzzis, a heated pool and 8 BBQs. Just across the road from the complex is Kamaole Beach Park III, one of Maui's best beaches. It takes 2-3 minutes to slowly walk from the unit to the beach. It is a wonderful place to watch sunsets or whales during their winter season, and is safe for swimming and excellent for snorkeling and scuba diving. There are Resort and Reservation fees, collected by Kamaole Sands Resort from every guest ($62 total one-time charge). We don't collect this, please be prepared to pay. We ask all guests staying over 9 nights to pay $80 for a mid-stay cleaning (the cleaners will clean all condo, except linens/towels/fridge). NOTE that we have the following CUSTOM cancellation policy. We make refunds if we can re-book your dates, and will refund what we can recover minus $200 cancellation fee. We had to choose No Refunds as VRBO policy because they don't have a policy that would match ours. In fact, our policy might be better that others, because we can make refunds if we re-book even you cancel a few days before arrival. It is described in our rental agreement that we'll ask you to sign. We HIGHLY recommend getting a travel insurance as it will completely remove the cancellation worries as well as cover any travel accidents. Hello! We are Igor and Elena Kounitski, and we own two condos in Kamaole Sands. Both condos are on the ground floor in adjacent buildings 6 and 7, making it easy to book both if you more than one condo. We love Maui and we'll be thrilled to have you stay with us! The condo is on the ground floor, which is a huge convenience. You step on the grass right from your own lanai. No elevators or stairs. Just you and your Hawaii living, no intermediaries, well... your car sometimes! Kamaole Sands is the only "resort" condominium complex in South Kihei with beautiful tropical grounds. Centrally located withing the complex with the lanai overlooking the vast and colorful courtyard. A large mirror in the living room opens up even more space, and reflects the fountain across building 10, which is not normally seen from our building. Beautifully remodeled, excellent mattresses on beds. Tile throughout. Clean and well stocked. shower, Remodeled with shower and glass doors. Flexible shower. shower, Remodeled with wider shower stall. Great location! We loved being right across the street from the beach. Condo is nice with everything you need for a fun vacation. Thank you very much, Marla! We are very happy that you spent your vacation with us and that you enjoyed it. Aloha! This quaint 1 bedroom unit is cozy with everything you need to explore Maui. Close to Kamaole 3 beach (one of my favourites) and close to restaurants and bars. Owner's are really nice to deal with as well. Great Condo - Great Loacation! We had a great two weeks in this condo...great location on the ground floor close to two of the BBQ areas. The condo had beach chairs, umbrella, boogie boards, and basic spices and condiments in the kitchen. The owners were responsive to our questions, and were pleasant to deal with. I definitely recommend this unit. Beautiful property, really enjoyed our stay. Just got back from a stay in this unit. The owner was a pleasure to deal with, the unit was nicely updated and comfortable. The pullout bed was just as comfortable as the king bed. Everything we needed was there. Loved the open concept kitchen. Don't be afraid to look in closets, etc because we found more things every day that we could use. Beautiful complex, incredibly well maintained and perfect proximity to the beach. If there was any complaint, it's that the lanai was on the small side but there was a large grassy area for the kids to play on, so that made up for it. We loved this condo and hope to use it again in future. Dear Melanie, I am thrilled that your vacation was successful and that we could play a role to help it happen! I hope to have you stay again with us in the future. Nicely renovated unit in a beautiful complex, conveniently located on the main floor. The property is very well-maintained and beautiful and lush. The pool was very clean. Nice location across the road from the beach.